6) Chef Art Smith’s Homecomin’ – The Landing area of Disney Springs is home to a warm and inviting full service dining location that serves up farm-to-fork cuisine inspired by the fresh and local flavors of Florida. 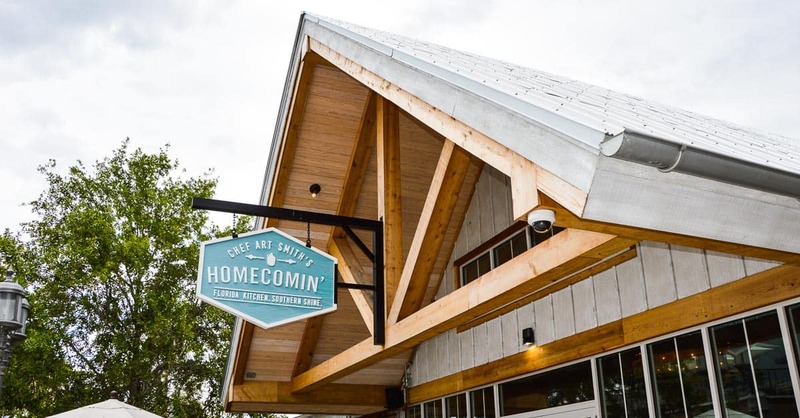 Chef Art Smith’s Homecomin’ was created by the famous chef and invites guests to dine in rustic areas or a massive outdoor patio on delicious options that are quickly making it a fan favorite. Guests who are looking to get the most value out of their meal should start with the Jasper Board appetizer which features smoked fish dip, pimento cheese, shaved country and Tasso hams, bread and butter pickles, candied pecans, and buttermilk crackers for $18.00. The bets entrée option to order is the Florida Grouper which costs $32.00 and comes served with KC Greens and an iron skillet carrot soufflé. Guests $11.00 Hummingbird Cake which is a pineapple-banana cake with cream cheese frosting served with a scoop of vanilla bean ice cream. To round out the delicious and valuable full service meal at Chef Art Smith’s Homecomin’, guests should order up the Muleshine cocktail which features Tim Smith’s Climax Moonshine, peach puree, fresh lime juice, and a splash of Q Spectacular Ginger Beer.